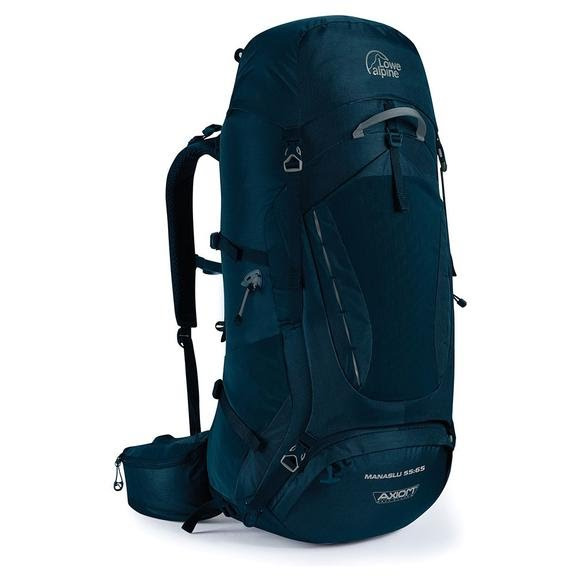 The Manaslu is Lowe Alpine's go to pack that delivers function and versatility while always looking dynamite. Be it a wild camp on a remote beach or six months on the sub-continent, the Manaslu delivers serious camp vibes kudos for those who want technical gear that really works. The Manaslu is Lowe Alpine &apos;s go to pack that delivers function and versatility while always looking dynamite. Be it a wild camp on a remote beach or six months on the sub-continent, the Manaslu delivers serious camp vibes kudos for those who want technical gear that really works. The cleverly designed Axiom 5 back system provides you with our simplest ever back-length adjustment technology, while the rotating hipbelt provides stability if the terrain becomes challenging. You will also appreciate the ventilated spacer-mesh back, especially in warmer climates and the high specification foam in lumbar will help support those heavy loads as you carry your gear to a remote mountain camp. A hipbelt that moves with your body as you walk, reducing pressure and increasing comfort. Unique walking pole holders that have a TPU grip for poles with spikes, and a pull out elasticated loop for poles with rubber caps.